Maryland is one of the toughest gun control states in the nation and passed the Maryland Firearm Safety Act of 2013, which, among its provisions, bans 45 assault weapons and limits gun magazines to 10 rounds. Maryland also has strict laws governing the transportation of guns and issues concealed carry only on a “need-based” determination. Maryland does not recognize any out-of-state carry licenses. Gun rights advocates are trying to pressure Gov.-elect Larry Hogan, a Republican, to get involved in a legal effort by a coalition of gun owners and gun rights groups to invalidate the law. Twenty-one states have filed briefs with the court supporting the challenge. In a news conference in November after winning the election, however, Mr. Hogan said he would leave it to the courts to decide. That’s not stopping advocates like Mr. Tonnesen, 50, from pleading to Mr. Hogan to investigate whether Maryland is targeting out-of-state concealed-carry holders. On his way up north to visit family for the holidays this year, Mr. Tonnesen left his weapon behind but came armed with a letter addressed to Mr. Hogan instead, detailing his arrest last year and questioning why Maryland is using its limited resources to target out-of-staters. Mr. Hogan’s office confirmed receipt of the letter but declined further comment on it. As governor, Mr. Hogan will “uphold both the U.S. Constitution and the laws of Maryland; he will not overturn existing Maryland law and will work across party lines to reduce gun violence,” Hogan spokeswoman Erin Montgomery told The Times. Academics say Mr. Hogan is likely to stay far away from gun control issues as he begins his tenure as a rare Republican elected official in a mostly blue state. Mr. Hogan ran in the blue state on his strengths as a businessman — someone who understood working-class families and the consequences of increased taxes. With Democrats holding nine of the state’s 10 seats in Congress, having large majorities in both state houses, and with the attorney general and state comptroller both being Democrats, if Mr. Hogan wants to generate good will to pass through some of his economic changes, he will have to stay away from gun control, which the majority of the state favors, Mr. Lublin said. According to a 2013 poll conducted by Gonzales Research & Marketing Strategies Inc., which surveyed more than 800 of the state’s registered voters, 58 percent said they support the gun control law enacted under Gov. Martin O’Malley. As for the MDTA, officials maintain only people who are committing traffic violations are pulled over, not those who have out-of-state concealed carry licenses. “It is important to note that no gun-permitting information is programmed into any License Plate Reader units accessible to MDTA Police,” Mr. Green said. In Mr. Filippidis‘ case, he was pulled over because he was going 72 mph in a 55 mph zone and was tailgating the officer, Mr. Green said. “The officer observed the concealed carry gun permit while the driver was searching for his driver’s license and vehicle registration in his wallet,” Mr. Green said. “After personally observing the gun permit, the officer asked the driver to step from the vehicle and inquired about the location of the weapon,” Mr. Green said. “The driver denied that there was a weapon in the vehicle. Mr. Filippidis vehemently denies there was any smell of marijuana in his car, and he didn’t know that was the excuse used to justify the search of his SUV. He did say he may have been going a little over the speed limit, and his wife was confused about the whereabouts of his gun. As for Mr. Tonnesen, a search of his vehicle was justified after the same officer felt threatened and that Mr. Tonnesen was hiding something as both of his hands weren’t readily visible. He was also pulled over for speeding. BELLEVUE, WA – The Citizens Committee for the Right to Keep and Bear Arms today named the Top Ten Anti-Gunners for 2014, with billionaire Michael Bloomberg topping the list for using his wealth to buy elections in an effort to turn the Second Amendment right to keep and bear arms into a heavily-regulated government privilege. “The people on this list have worked very hard to undermine the civil rights of every American citizen who owns a firearm, or may one day want to, and they deserve vilification,” CCRKBA Chairman Alan Gottlieb said. CCRKBA also gave “dishonorable mention” to Virginia Gov. Terry McAuliffe for wanting to resurrect one-gun-a-month legislation in his state, Connecticut Gov. Dannel Malloy and Colorado Gov. John Hickenlooper, who both have pressed their gun control agendas, driving businesses and jobs out of their states; California Attorney General Kamala Harris, who has steadfastly defended arbitrary and discretionary concealed carry permits; former CNN commentator Piers Morgan for continuing his anti-gun rhetoric even though it forced his program’s cancellation. Also on the list, Gerald Ensley, the Tallahassee Democrat columnist who wrote in November that handguns and semiautomatic modern sporting rifles should be banned, and that the Second Amendment should be repealed; and former Supreme Court Justice John Paul Stevens, who wrote earlier this year that he would like to see the Second Amendment changed to confine the right to keep and bear arms to people serving in the military and state militia. And it is this “means of elucidation” that infuriates the left as well as spokesmen for terrorist groups. They will harangue, scream, berate, shout, bellow, and yell – in an effort to drown out any meaningful discussion. And too often, in a gesture of being polite, one side quietly waits until the screaming is completed, but by then, time is up for a genuine interaction of ideas. Rather than having the “disputants argue cooperatively in order to acquire more wisdom than either of them had when [they] began,” censorship rears its ugly head. In today’s world we see “silliness, baseness and deception” so much so that it “submerges the kernels of truth.” As a result, freedom of speech “is no longer respected as a procedure of the truth and [instead] becomes the unrestricted right to exploit the ignorance, and to incite the passions, of the people.” Consequently, how is it possible that the Ninth Circuit Court ruling that students can’t wear American flag T-shirts because they may offend Mexican students celebrating Cinco de Mayo is upheld? How is it conceivable that no matter the facts of the Ferguson situation, Obama, Holder, and Sharpton continue the false assertions that result in violence, destruction, and fear? Moreover, Obamacare lies are getting as high as the original stack of pages that constituted the law, while any credible debate about aspects of the law are ignored. Anyone exposing the underbelly of the law is demeaned and humiliated. Heck, we were too stupid to comprehend the scam, according to Gruber! Therein lies the crux of the matter. As the government whittles away freedoms, the people become exhausted and dejected and eventually surrender because it is just easier than speaking up. To wit, at a college where I teach, the internet security policy has now restricted access to the site “Religion of Peace.” Under the category of “Hate/Racism,” “access to this site is blocked according to the organization’s security policy.” But the Religion of Peace site includes “direct reference to the Qur’an, Hadith and Sira – the sacred texts that objectively define [Islam].” The site is “not a political site and [they] do not promote any particular religion.” In essence, the site is a valuable resource of articles from national and international sources (including American Thinker) that covers a wealth of information on Islam. The creators of this site ask if it is “possible to reform Islam into a 21st century religion, or is the dysfunctional and hate simply too deeply rooted within the teachings and history of the faith?” Though “pessimistic about reform,” they accept that “there are intelligent and compassionate members of the Muslim community who disagree[. ]” Thus, the site is a forum that seeks the free expression of ideas. Nonetheless, a school of higher learning will not permit its students or faculty access to it. Thus, Greg Lukianoff, president of FIRE, in the Encounter Broadside publication entitled Freedom From Speech, explains that “unfortunately, far from teaching the intellectual discipline that welcomes a free and robust exchange of ideas, campuses are actively accelerating the push for freedom from speech.” Often a desire to avoid “intellectual discomfort” rather than a pledge that one must tackle hard issues that entail allegedly “hurtful” “inconsiderate” or “offensive” speech is making the duty regarding free speech less compelling. This is a dangerous trajectory for a free people. Which is why it is heartening to learn that the William F. Buckley Program at Yale University “refused to be bullied by the Muslim Students Association” and did not “rescind an invitation to Ayaan Hirsi Ali to speak on campus.” This stands in stark contrast to Brandeis University, which capitulated to the demands that Ms. Ali not be permitted to speak. The truth can be found only “when the human mind is capable of receiving it.” Yet far too many Americans have been inundated with pseudo-empathy lessons. Furthermore, many students are historically illiterate and cannot comprehend that “[w]e live in a world in which people are censured, demoted, imprisoned, beheaded, simply because they have opened their mouths, flapped their lips, and vibrated some air. Yes, those vibrations can make us feel sad or stupid or alienated. Tough [s***]. That’s the price of admission to the marketplace of ideas. Hateful, blasphemous, prejudiced, vulgar, rude, or ignorant remarks are the music of a free society, and the relentless patter of idiots is how we know we’re in one” (attributed to Daniel Gilbert). European laws balance freedom of expression against other rights such as the right to privacy and the right not to be offended. Therefore, European countries have various laws prohibiting hate speech, religious denigration, and racism. However, ‘almost absolute’ freedom of speech, with exceptions for incitement to violence and defamation of individuals, ‘makes America unique.’ Free speech is ‘not a balancing test’ against the so-called right not to be offended. Offensive speech is constitutionally protected if it’s true or mere opinion. Without “honest reflection” via freedom of speech, we all suffer. December 29, 2014 marked the 124th Anniversary of the murder of 297 Sioux Indians at Wounded Knee Creek on the Pine Ridge Indian Reservation in South Dakota. These 297 people, in their winter camp, were murdered by federal agents and members of the 7th Cavalry who had come to confiscate their firearms “for their own safety and protection”. The slaughter began AFTER the majority of the Sioux had peacefully turned in their firearms. When the final round had flown, of the 297 dead or dying, two thirds (200) were women and children. Around 40 members of the 7th Cavalry were killed, over half cut down by friendly fire from the Hotchkiss guns of their overzealous comrades-in-arms. Twenty members of the 7th Cavalry were deemed “National Heros” and awarded the Medal of Honor for their acts of cowardice. We do not hear of Wounded Knee today. It is not mentioned in our history classes or books. What little does exist about Wounded Knee is normally the sanitized “Official Government Explanation” or the historically and factually inaccurate depictions of the events leading up to the massacre on the movie screen. Before you jump on the emotionally charged bandwagon for gun-control, take a moment to reflect on the real purpose of the Second Amendment- The right of the people to take up arms in defense of themselves, their families, and property in the face of invading armies or an oppressive government. The argument that the Second Amendment only applies to hunting and target shooting is asinine. When the United States Constitution was drafted “hunting” was an everyday chore carried out by men and women to put meat on the table each night, and “target shooting” was an unheard of concept, musket balls were a precious commodity in the wilds of early America, and were certainly not wasted “target shooting”. The Second Amendment was written by people who fled oppressive and tyrannical regimes in Europe, and refers to the right of American citizens to be armed for defense purposes should such tyranny rise in the United States. As time goes on the average citizen in the United States continues to lose personal freedom or “liberty”. Far too many times unjust bills are passed and signed into law under the guise of “for your safety” or “for protection” . The Patriot Act signed into law by G.W. Bush, then expanded and continued by Barack Obama is just one of many examples of American citizens being stripped of their rights and privacy for “safety”. Now, the Right to Keep and Bear Arms is on the table, and will, most likely be taken away for “our safety”. Before any American citizen blindly accepts whatever new firearms legislation that is about to be doled out, they should stop and think about something for just one minute- Evil does exist in our world. It always has and always will. Throughout history evil people have committed evil acts. In the Bible one of the first stories is that of Cain killing Abel. We can not legislate “evil” into extinction. Good people will abide by the law, defective people will always find a way around it. And another thought Evil exists all around us, but looking back at the historical record of the past 200 years across the globe, where is “evil” and “malevolence” most often found? In the hands of those with the power- governments. That greatest human tragedies on record and the largest loss of innocent human life can be attributed to governments. Who do governments target? “Scapegoats” and “enemies” within their own borders … but only after they have been disarmed to the point where they are no longer a threat. Ask any Native American, and they will tell you it was inferior technology and lack of arms that contributed to their demise. Ask any Armenian why it was so easy for the Turks to exterminate millions of them, and they will answer “We were disarmed before it happened”. Ask any Jew what Hitler’s first step prior to the mass murders of the Holocaust was- confiscation of firearms from the people. Wounded Knee is the prime example of why the Second Amendment exists, and why we shouldn’t be in such a hurry to surrender our Right to Bear Arms. Without the Second Amendment we have no right to defend ourselves and our families. Eleanor Roosevelt Had a Carry Permit, So Why Can’t You? 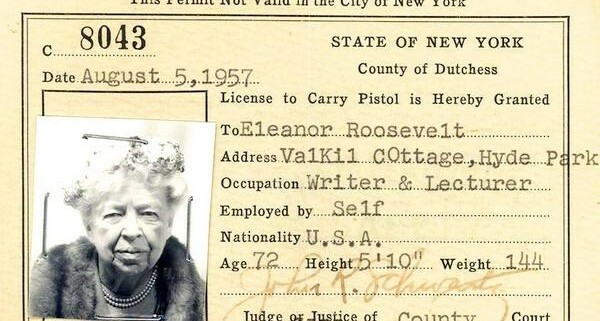 Eleanor Roosevelt had a permit to carry a handgun in New York state (though not in New York City, it should be noted). If you find yourself in a jurisdiction that forbids law-abiding citizens from packing heat, you might ask why she could carry but you cannot. Thirty years ago, 80 percent of Americans supported stricter gun control laws. Certain guns were banned. Organizations formed and expected they would soon “ban handguns” in private hands. In 1987 Florida passed a “shall issue” concealed carry law that required local government to give any honest and sane adult a permit to carry a gun concealed on his/her person or in a purse or car. Today, 41 states have enacted such laws. In 2007 there were 4.5 million such permits. Today there are more than 11.1 million. Arizona, Vermont, Wyoming and Alaska do not even require permits to carry for their citizens. 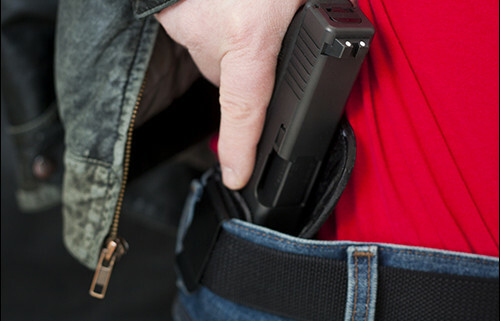 Five percent of the adult population has a concealed carry permit. One in 20. This drive has been fueled and validated by the fact that violent crime falls faster in states with concealed carry laws and even faster as more citizens avail themselves of that “new” right. The crime rate per 100,00 people has declined as carry permits have increased. In 1987, for instance, the total crime rate was 5,550 and the violent crime rate was 610. In 2013, those numbers stood at 3,099 and 368. In arming herself, Eleanor Roosevelt was ahead of the curve. Image via the Twitter feed of historian Michael Beschloss. http://www.freedomfightersfoundation.org/wp-content/uploads/2014/12/Elenor-Roosevelt-CCW.jpg 395 600 Freedom /wp-content/uploads/2015/06/ff-logo-flag-340x92-300x81.png Freedom2014-12-29 02:31:092014-12-29 02:31:09Eleanor Roosevelt Had a Carry Permit, So Why Can't You? Leftist gun control advocates use divide and conquer tactics on a routine basis, to deprive Americans of 2nd Amendment rights. 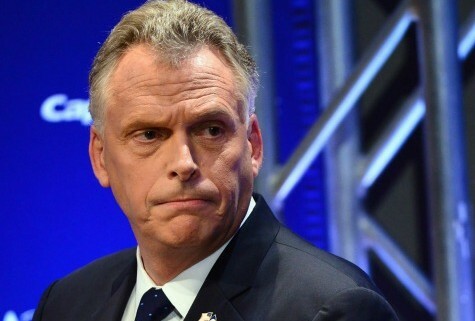 A clear current example is the current effort by Virginia’s new governor (and Clinton apparatchik) Terry McAuliffe to impose new restrictions on Virginia gun ownership, though it is unlikely to get through the state’s Republican-dominated legislature. The Washington Post lamented this likely outcome in typical fashion, beginning an editorial by invoking polls purporting to show that “Virginians, by overwhelming margins, favor tighter restrictions on gun purchases and ownership.” Thus, by this narrative, which would warm the heart of any totalitarian from Mussolini to Big Brother, the evil minority (through a representative legislature!) is denying the will of the righteous majority. And indeed, McAuliffe’s proposal is tailored to attack just a small minority of gun owners, to wit: collectors first, pretend to support hunters and everyone else, and drive a wedge into defenders of the 2nd Amendment. The tactic presents gun control proposals that sound reasonable to many people, including most Americans who support 2nd Amendment rights, and start nibbling. McAuliffe’s proposed restrictions focus on two favorite targets of 2nd Amendment opponents, closing the so-called gun show loophole and limiting handgun purchases to one per month. There is little or no evidence that such restrictions keep guns from felons, or reduce crime or gun violence. But that’s of no consequence to the left, rather it’s a start. The tactic works because it really targets only a small minority of gun owners, and a tiny minority of the population as a whole — gun collectors. The “gun show loophole” applies to private sellers at gun shows, who are not 01 FFL federal firearms licensees (i.e., those who own commercial gun shops and are also the majority of sellers at typical gun shows.) 01 FFLs (both commercially and at gun shows) sell the vast majority of the modern handguns and sporting rifles (assault guns in leftist lingo), that so bedevil gun controllers. These sellers must do federal background checks. Private sellers might offer similar wares, but typically focus on collectables that are marketed to other collectors. They also tend to overvalue inventories, making them unappetizing compared to what the licensed dealers offer. And they are prohibited from knowingly selling to felons, mentally disturbed individuals, or others restricted under federal law. They just are not required to do background checks. How often do felons and mentally disturbed people drive out of their way to gun shows, pay the entrance fees, and successfully navigate their way to a private seller of a desirable modern firearm? Hardly ever, and then they still have to get past a wary seller, who is most likely an upstanding citizen who has no desire to break the law or incur liabilities. Such legislation helps nobody, but it sounds good. It only immediately injures the small minority of gun owners that collect firearms for a hobby, making it politically palatable in an otherwise pro-gun state. The same with a one purchase per month handgun limit. Few people have the desire or financial wherewithal to buy more than one gun a month, and so the restriction sounds reasonable. Most people that do are pretty well-off gun collectors. But does imposing this restriction do any good? Again, there is scant evidence that it does, and only a very few, very blue states so restrict purchases. It is just a way to limit gun rights in a palatable way. The gun controllers, at least at this stage of the game, are particularly “respectful” of the interests of hunters. Often the politician in charge of the move (as in McAuliffe’s case) is identified as a gun owner or hunter himself (though McAuliffe has made no secret of his anti-gun rights stance.) In particular, the favorite firearm of President Obama and Joe Biden — the shotgun — is kept off limits to restriction, since it is also the most common and versatile gun for hunters. Trying to drive a wedge between hunters (including the new class of liberal “hipster” hunters) and other gun owners is a common tactic, straight from Saul Alinsky’s book. Thus, when shotguns are used in notorious incidents, like the Navy Yard shootings (where originally police and news organizations were quick to wrongly identify the weapon as an AR-15), or an incident in January 2014, at a Columbia, Maryland mall, there is no conspicuous call for restrictions — yet. Virginians need only look across the Potomac into Maryland to see the end game of the “reasonable” restrictions proposed by Governor McAuliffe. Maryland moved from state background checks and one-gun-per-month limits, to imposing waiting periods for pistols and modern sporting rifles. Even that proved insufficient when the political opportunity the came after the Connecticut shootings in 2012. That led to far more sweeping restrictions which now outlaw modern sporting rifles, impose licensing requirements for all new handgun purchases, and limit magazine capacity to ten rounds. Local gun stores are being driven out of business across the state, and Beretta is moving its Maryland facility to Tennessee, at the cost of hundreds more jobs. And while Marylanders (at least outside the D.C. suburbs and Baltimore) have fought back by electing a Republican governor, the new attorney general (Brian Frosh) was the chief legislative proponent of the new laws, and the legislature still remains solidly Democrat. More to the point, the hypocrisy and dishonesty of Maryland’s leftist politicians should send a chill up the spine of any supporter of 2nd Amendment rights, in Virginia or nationally. In Maryland, in the months between the passage of the new gun control law in February 2013 and its effective date in October, those “minor, reasonable” restrictions already in place worked to frustrate and hinder Maryland gun owners from purchasing soon-to-be banned or heavily restricted firearms. The one-gun-per-month limit, seven-day waiting period, and state-mandated background checks created a confused and backlogged mess that denied honest gun owners their rights and put them in legal peril. Yet, despite the difficulties and risks, gun sales boomed, as Marylanders purchased tens of thousands of high-capacity pistols and modern sporting rifles. Marylanders today own many more of these “dangerous” weapons than would have otherwise been the case. Yet in his recent campaign, with Marylanders owning more guns than ever before, Frosh ludicrously claimed that the new law would save “thousands of lives.” Of course, it hasn’t saved anyone, though perhaps the new glut of weapons has deterred a crime or two. And unusually, Maryland officials seemed to go out of their way to turn the Columbia Mall shooting into a would-be mass killing (when there is contrary evidence) that was frustrated only because the shooter had a shotgun rather than an AR-15. Remember, shotguns good (for now) other guns bad. Virginians should be thankful that alert legislators seem ready to put the kibosh on McAuliffe’s initiative. He will keep trying. On December 20, 16-year-old Jawaad Jabbar arrived at the mall too late to get a pair of limited edition Air Jordan athletic shoes, so he pulled a gun on a man who did get a pair and asked him to hand over the shoes. Instead of complying, the would-be victim–a concealed carry permit holder–pulled his own gun and shot the teen dead. When the juvenile pulled his gun, one of the adults pulled his concealed carry handgun and shot the teen once, killing him. The Freedom Fighters Foundation as do many patriots are concerned that the Obama administration will use a United Nations treaty as a basis for executive action on gun control. The U.N. Arms Trade Treaty was set to take effect on Christmas Eve. Though the United States delegation to the U.N. has supported the treaty, it has very little chance of being ratified by two-thirds of the Senate. But there is still reason for concern, said Catherine Mortensen, spokeswoman for the National Rifle Association. “Even now, with an existing appropriations rider prohibiting action to implement the treaty unless it is approved by Congress, administration officials are publicly professing support for international efforts to bring the treaty into effect. That’s outrageous,” she added. The U.N. General Assembly adopted the treaty in April 2013 with a vote of 154 to 3. The State Department points out that only Iran, Syria and North Korea opposed it. “Make no mistake, we would never think about supporting a treaty that is inconsistent with the rights of Americans citizens to be able to exercise their guaranteed rights under our constitution,” Secretary of State John Kerry said a few months after the passage of the treaty. Still, the treaty has some very unsavory supporters, said Mortensen of the NRA. “The United Nations is trying to establish what they call basic norms and bring international pressure on the United States to eviscerate our Second Amendment Rights and they have found willing allies in the Obama administration and John Kerry,” Mortensen added. Investor’s Business Daily editorialized this week warning that Obama could use it as a basis for executive action on guns, even if it is not ratified by the Senate. Alabama voters adopted a state constitutional amendment to guarantee for the right to bear arms after lawmakers cited the threat of international agreements the could limit gun rights. A provocative public service announcement released by a San Francisco-based production company encourages children to put themselves at risk and commit a slew of crimes by stealing their parents’ guns from home and turning them in at school. In the anti-gun ad, published Dec. 13 by Sleeper 13 Productions, a boy who appears to be in his early teens is shown walking up the stairs of his home and wandering into his mother’s bedroom. The boy is shown opening the drawer to his mother’s dresser, where a handgun is hidden. The boy takes the gun from the dresser and leaves the room. The ad then flashes to his school. Sitting in a classroom, the boy ventures up to his teacher’s desk after the rest of his classmates have left. The tension building in the scene breaks, and the boy produces the gun from his backpack, slamming it on his startled teacher’s desk. What the ad-makers are encouraging is highly illegal and invites danger. The boy would be guilty of weapons theft, illegal concealed carry and carrying a weapon on school property. There are few things the media loves more than blaming Republicans for anything bad that happens. The worse the event, the greater the glee. But the more the glee, the less likely it is to be true. When the shoe is on the other foot, however, they sing a different tune. No one would mistake a gangbanger from Baltimore for a Tea Partier, so in the immediate aftermath Ismaaiyl Brinsley’s assassination of two New York City police officers there was no media speculation as to his political beliefs. And since it was discovered that he was a participant in the anti-police protests that have enveloped progressive activists and politicians the last few months, no mass speculation will occur. It’s an amazing turn of events, especially considering how they’ve reacted in past events. After it turned out to be a different man with the same name, something he didn’t bother to check before reporting it, he and ABC News were forced to apologize. When Congresswoman Gabrielle Giffords was shot in Tucson, Arizona, the media couldn’t contain their wild speculation that, since Giffords was a Democrat, a Republican had to be responsible. Every mainstream media outlet and progressive leftist organization settled on one culprit on which to focus the blame – Sarah Palin. The former Alaska Governor had a map of the United States with 20 congressional races highlighted with “crosshairs” on it marking districts held by Democrats she thought were winnable for Republicans. It was, and still is, a common practice. The shooter, the story went, must’ve been inspired by that map and the “heated partisan rhetoric” of the Tea Party to try to kill Giffords. It simply had to be. That became the story, even when it became clear the shooter, Jared Lee Loughner, had a long history of mental illness. Never let the facts get in the way of a good meme. Every news outlet and progressive activist group ran with the unproven story – Palin might as well have pulled the trigger herself. The feeding frenzy was on. CNN was all in; the Washington Post couldn’t contain itself; the New York Times swallowed the hook, and it went on from there. But that feeding frenzy was empty calories stuffed with the progressive’s insatiable desire to politicize tragedy for their own ends. The truth of Loughner was one of mental illness tinged with left-wing sensibilities – a 9/11 truther who hated George W. Bush and listed the Communist Manifesto as one of his favorite books. But no one took to the newspapers or airwaves to warn of progressive maniacs killing those they deemed not progressive enough. No, the “Tea Party did it” meme stuck, and sticks to this day with people lacking the brain power to accept facts. Which brings us back to the assassination of Rafael Ramos and Wenjian Liu. Their “crime” was being police officers at a time that police officers find themselves the latest foil progressives are using to advance their agenda. While NBC News employee Al Sharpton led the marches in the street, President Barack Obama led the political action to nationalize supervision and administration of local police. The cover was the deaths of Michael Brown and Eric Garner. The facts surrounding their deaths didn’t match the need – one attacked a cop and tried to take his gun, the other had massive health issues and resisted arrest for breaking one of thousands of senseless laws progressives have foisted on us – but with the media on their side, facts are malleable. Martyrs to the cause were born. But in the birth of those martyrs, the afterbirth spawned what these progressive propaganda manipulations always spawn – hatred. Protesters chanted they wanted “Dead cops,” and these “leaders” were silent. They knew it was happening, but it was good for business – you never attack your truest believers. Brinsley was the personification of that, and he acted. Brinsley’s mentality was on full display in one of his last social media posts where he wrote, “They take 1 of ours, let’s take 2 of theirs.” The tribal mentality progressives foster was on full display – us against them, with the “us” and “them” being interchangeable depending on the need. Progressives don’t see Americans, they see groups of people they can separate and manipulate to motivate to support a cause of vote a specific way. Brinsley was the natural progression, if you will, of that type of manipulation. I doubt those journalists who blamed Palin for the Giffords shooting believed it at the time they wrote it, but they wrote it hoping others would. They didn’t correct or retract those posts because they didn’t want to, they simply threw a grenade and moved on. That’s what progressives do – throw grenades. They usually fizzle, as with the Occupy Wall Street crowd, but in the execution of Ramos and Liu, that grenade went off. Now they’re busy attempting to distance themselves from what they caused, pretending it was simply a “fringe” and not an obvious possibility they’d preached warnings of just a few years ago. Brinsley was more than likely insane, to one degree or another, but his insanity was irradiated and mutated by the progressive rhetoric and lack of common sense on display from the likes of Sharpton, de Blasio, Holder and even Obama. A fuse, after all, is just a fuse until it meets a spark.